Those who passed by hurled insults at him, shaking their heads and saying, “So! You who are going to destroy the temple and build it in three days, come down from the cross and save yourself!” In the same way the chief priests and the teachers of the law mocked him among themselves. “He saved others,” they said, “but he can’t save himself! Most dictionaries define crucifixion with a mention of Jesus. But to some crucifixion is simply extreme punishment and to some it is specifically tied to undeserved or unjust punishment. But crucifixion carries another, important implication—shame. The mockery of the passing crowds was not by accident, but part of the punishment’s design. Despite the many artistic depictions of loincloths, victims were hung naked in a public place specifically for the purpose of shaming them. Crucifixion was common and so was public shaming of the crucified. It would be an unusual day in Jerusalem if there was no one for the crowds around Golgotha to mock. The same is true today. It is an unusual day when social media does not hoist on a hashtag a victim for our mockery and derision. 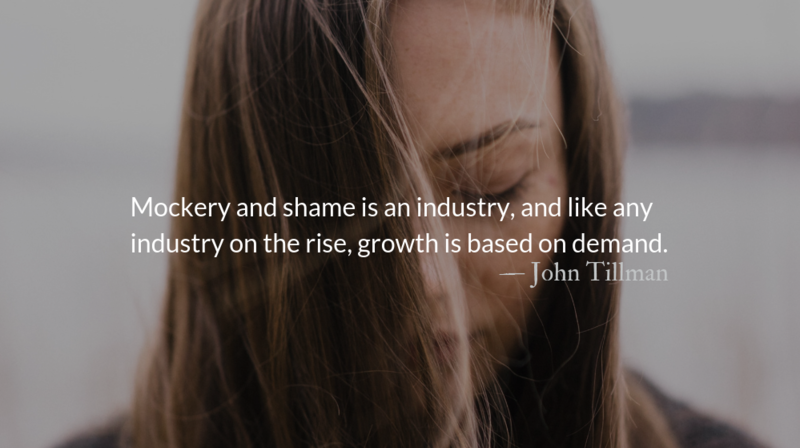 Mockery and shame is an industry, and like any industry on the rise, growth is based on demand. The industry of shame might not have replaced the industry of journalism yet, but it has disrupted the market. Journalism, staring down the rise of shame-based tabloids, has blinked, and adjusted their business model. When preachers (or devotional writers) talk about sin and culture it is natural for Christians to first think of the sins of others. Take captive those thoughts now. Don’t allow yourself to engage in spiritual “whataboutism.” Brush aside thoughts of others’ wrongs. The Holy Spirit comes to help us see our own sins. If you are reminded of others’ sins, you aren’t listening to the right spirit. Focus on how Jesus responded to shaming and mockery. Hebrews says that Christ “scorned the shame” of the cross. This is not a reference to “clapping back” at accusers. Christ did not scorn the shamers. When we remove mockery and shame as options, many of us will be at a loss for how to communicate in our world. This is why we must ask the Holy Spirit to convict us and respond on our behalf, making us salt and light with words of truth and love. Shame is the emotional weapon that evil uses to corrupt our relationships with God and each other and disintegrate any and all gifts of vocational vision and creativity. Read more about Weaponized ShameChristians have the opportunity live as salt and light in a bland, rotting, and dark digital world. What we click, how we respond—if we we respond at all—shares a testimony to the world.